The story opens with Batman, in the Batmobile, chasing Mastermind and the Perfesser after a heist. While Mastermind drives, the Perfesser is occupied writing his memoir. He recounts how he helped Mastermind and Mr. Nice escape prison. In the present, Mastermind is leading Batman on a merry chase through a pre-planned route through Gotham. Ultimately, Batman catches the crooks. Mastermind immediately spills the beans that while Batman was chasing them, Mr. Nice was breaking into a nuclear arsenal, making the trio a nuclear power. 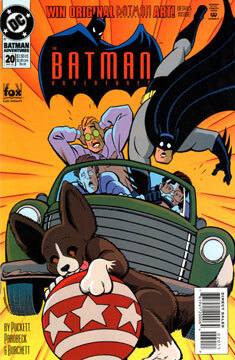 Batman places a call to Commissioner Gordon, resulting in a puppy being placed in Mr. Nice’s path. The puppy wins. The trio goes back to jail. Sadly, this is not a good issue. I like the hook of the story, but on the page is just doesn’t play out well. I don’t know that I’d want to see this animated, but being on screen could only have helped the extended car chase. Using the three crooks as the primary antagonists was a good idea, but they didn’t play as strongly as they did in “The Last Riddler Story.” Ultimately, this issue bored me. Even Parobeck wasn’t at his best this time around. The art is still excellent, but flip back a few issues and you’ll see this one didn’t have the same polish. Plus, what’s with the dogs on page five? Those don’t look animated-style at all! I’d still like to see customs of Mastermind, the Perfesser, and Mr. Nice. I’ll get around to them someday. No, except as visual reference for the above mentioned customs.